Tool for Checking Hardness and Stiffness of Sports Surfaces. The 2.25 Kg CIST/883 Clegg Impact Soil Tester designed and manufactured by SD Instrumentation Ltd provides an easy and straightforward means for measuring the hardness condition of sports surfaces. 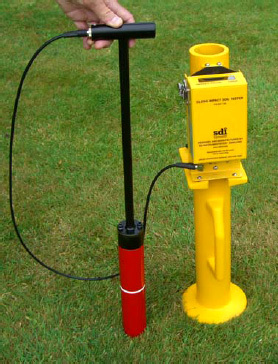 The equipment consists of a 2.25 Kg sports compaction hammer operating within a vertical guide tube. The Hammer falls through the guide tube when released and strikes the surface under test, decelerating at a rate determined by the stiffness of the material within the region of impact. The readout is clamped to the guide tube and the displayed reading is viewed from the top during use. Single button operation design provided for easy use. On board data logging and data storage with wireless data transfer facilities are features provided with the instrument. Users can download their test results from site to PC, wirelessly, using the PC software supplied with the instrument. This cable-free operation greatly enhances system reliability. The 2.25 Kg Clegg hammer provides good prediction of ball bounce for cricket surfaces and football pitches. Also used for equestrian surface checks the instrument is used to confirm uniform surface characteristics over play areas and horse tracks. The Tester provides a quick and accurate method for monitoring variations in strength and for helping to determine the uniformity of an area. An example of its simplest application is to help determine soft spots or hard areas. 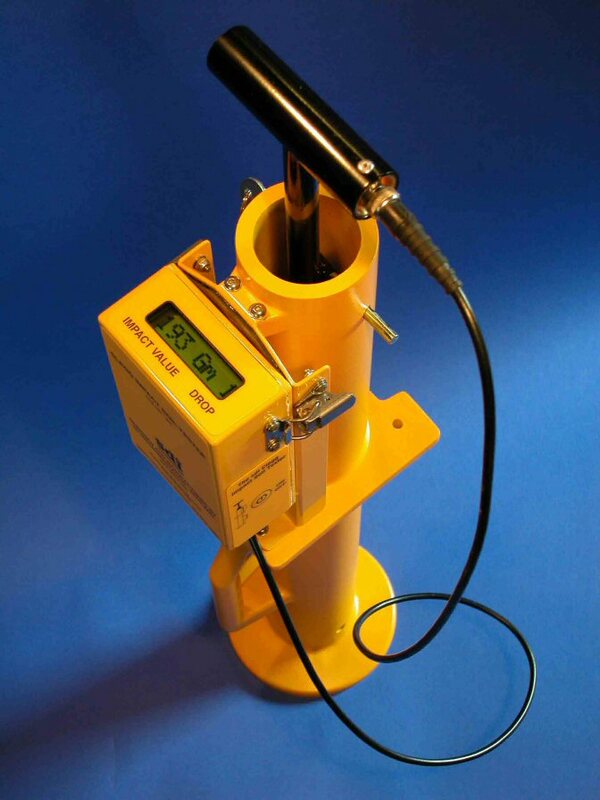 The Tester consists of a 2.25 Kg compaction hammer operating within a vertical guide tube. The Hammer falls through the tube when released and strikes the surface under test, decelerating at a rate determined by the stiffness of the material within the region of impact. The readout registers the hardness values in units of Gravities (Gm). The Gm value is an indication of soil strength. The CIST/883 Clegg Impact Soil Tester is a very rugged design suitable for prolonged use in damp, dirty and harsh site environments. The CIST/883 readout unit is made from high strength alloy that has been proven to last for decades. The unit runs from 2 x AA batteries for typically 12 months operation. The CIST/883 Clegg Impact Soil Tester is a compact and reliable instrument. A wooden Transit & Storage Case is included. Carrying out a test is quick and straightforward. The guide tube is placed in position vertically on the surface to test. The digital readout is located on the guide tube during testing allowing easy use as there is no need to hold the readout in the hand. The hammer is raised to a height marked as a white line on the 2.25 Kg hammer body as shown above right. The hammer is then allowed to fall freely. This procedure is repeated three times. The reading achieved on the third drop being recorded as the measurement value. 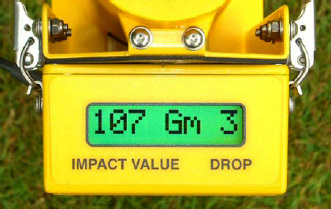 A third drop reading of 107 Gm is shown being displayed by the readout in the picture above. The stiffness - or ‘hardness’ of the surface as related to ball bounce and roll can be quickly established and it is easy to monitor stiffness changes due to moisture changes, grass growth and wear throughout playing seasons. Californian Bearing Ratio Calculation (%CBR) can be enabled along with a quality assurance algorithm to check the validity of the surface under test. The test data is recorded in the instrument and it is downloadable to a computer wirelessly by Bluetooth. Vertical display with readout unit clamped to Guide Tube – Easy to view. Up to 500 Gravities (Gm) in 1 Gm steps. readout. Sealed to IP67. 12 Month typical battery life. 3 drop Gm readings, time & date of each test & result validity pass/fail flag. Windows XP PC or laptop. Bluetooth USB Dongle provided. packages such as Microsoft Excel™. 9,999 x 3-drop test storage & output. Software Selectable %CBR display from CIST/883 LCD. advises user if surface being tested has failed (Readout displays ‘ABORT’). time/date setting and configuration set-up. Very easy to use. 71 x 13 x 13 cm. Instrument weight 4.6 Kg. Packed weight in case 10Kg.